« Who Do You Know Who Has Said All This? I was going to say something along the lines of "might be more useful graphed as a semi-log plot," but then I saw the spike in 2009. That is roughly a doubling of the "adjusted monetary base." Might be nice to have a definition of that term. Is it taking into account the velocity of money or something? I think this would be a bigger problem if the cash wasn't handed to banks that were immediately squirreling it away. Never trust a Princeton man to spell. This is the graph that Glenn Beck constantly uses. This data is probably the major reason why he always seems to be freaking out. I've been considering refinancing my house at the current rate of 5-5.25% 30 yr. Maybe I should also take out a home equity loan and invest in gold. For the moment this has had no effect, because the deflationary effect of the credit bubble collapsing is still bigger (see: ). Pushing string, as they say. In the long run, it will lead to inflation. But not in the next couple of years; the demand for cash instead of instruments/investments is still growing, and this is a fiercely deflationary force. This doesn't mean you shouldn't buy gold and silver, though. They also satisfy the demand for cash (store of value), and won't suddenly collapse in value as the dollar eventually must. You have to factor credit into the money supply. There used to be trillions in credit available, much of which came from the GSE's. Now that's reduced. So we have more actual cash, but less total money. I am trying to find the components of this on the St. Louis Fed's website. I believe the Fed has loaned out about a trillion of t-bills to banks to sell (such as Citigroup, etc.) to provide liquidity to the banks. I think these loans would count in the definition of monetary base. The jump has all come from the "Adjusted Reserves". Perhaps the "receivable" from the banks counts as part of the Fed's reserves. I would not be too sure that money will be paid back. This is what worries me so much more than housing prices going (that is healthy), unemployment rising, stock market crashing, etc. Ron Paul nailed it the other day in his opening remarks when he said something like "we have a fundamental misunderstanding of the difference between credit and capital. Credit is not capital. We cannot recapitalize the banks with credit created out of thin air, it simply can't work." There are no free lunches, creating money out of thin air will have consequences at some point. bbartlog, the Economist ran a story the other day that Gold (and possibly silver) had all the necessary conditions for a bubble to form, so I would be careful. If you really want a semi-dependable store of value now, do what the people of Iran often do and invest in real-estate. Prices are cheap now. 1. The only thing worse than inflation is deflation. 2. Most of this money was used to unfreeze the commercial paper markets, which I think is a good thing. The Adjusted Monetary Base is basically money coming into or out of the FED. Treat the FED as a black box. When the FED buys assets, it pays with freshly printed cash. Cash comes out of the box, assets go in. The reverse happens when the FED sells assets. The FED traded Treasury debt with the banks to get the mortgage debt off the banks' books (so they would not have to "write it down"/"mark to market"/whatever-you-want-to-call-it and have a loss showing on their books). The FED did this so that the banks would not look bankrupt, which they are. This was called the TAF program, and did not increase the monetary base. Treasuries came out of the FED, awful mortgage paper went in. No cash was transferred. TARP and related programs are what caused the increase. TAF was not enough. The banks had just too much bad paper. The FED did not have enough assets to part with to cover the bank debt, so they printed the money and bought more mortgage paper. However, the FED offered to pay interest on deposits held with the FED, so the cash never went out to the banks. They preferred to hold the cash on reserve with the FED, as this is essentially a risk free "investment." It is still in the FED's vaults, not circulating in the money supply (M1, M2, etc.) But technically it belongs to the banks, so it is part of the monetary base. The FED is running out of assets. Right now, it has mostly mortgage paper. It has a good amount of gold, but if it trades this out, the only thing "backing" the currency will be awful mortgage paper. If there is a run on the dollar, the FED will have nothing to sell in defense of the currency (assets going out of the FED, money going in, thus reducing supply and defending the "value"). So it opted to print the new money. Anyway, that's the basics of what's going on. You are forgetting about he velocity of money. The Money supply is a function of the base times velocity. St Louis Fed publishes this. The velocity is down so much that the increase in the base does not make up for it. The money supply is contracting. The Fed then conducted open market operations by buying treasuries to flood the system with cash. This should help. When the economy gets traction --and it will because of all this liquidity--they will have to drain the base. if they do this properly--very lucky if they can do it-- there will be little inflation. When they drain the base interest rates could spike however. I'm an Austrian. I don't believe in velocity. I do believe in the multiplication of the monetary base through fractional reserve banking. You are correct that the broader money supply (M1, M2, etc.) measures have not expanded in proportion to the expansion of the monetary base, as measured by the multiplier (MULT = M1/AMB, which is what I think you are referring to.) MULT has fallen dramatically, as you say, because credit markets are "frozen," no lending is occurring, and therefore the increase in the monetary base is being held as excess reserves at the FED, as I said previously. 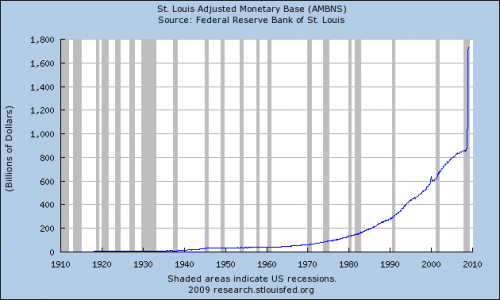 However, I think you are wrong about draining the monetary base. Though theoretically possible, the problem is not a question of timing or luck, and from a practical perspective it is impossible. The FED simply isn't holding a sufficient balance sheet at this point to be able to fetch enough money in the open market by selling its assets. If it sold every bit of gold and every bit of US Treasury paper it holds, it could not make a sufficient dent in the monetary expansion which has occurred to this point. Plus it would be holding trash (mortgage paper) as backing for the US dollar, which would encourage a run. It would also drive up the Treasury's borrowing rates, which would threaten Uncle Sam with bankruptcy. In order to sell the trash at a sufficient price to bring down the money supply, the FED needs to see inflation in the prices of these assets (e.g. the housing market), which as we all know is presently in a nosedive. So, the FED needs inflation to reduce the money supply. It's a catch-22. The only workable way I can see in the long run to prevent expansion of the broader money supply as a result of the expansion of the monetary base is for the FED to increase the reserve requirement. Which is to say, it must repudiate fractional reserve banking itself. Which would be fine by me, but would be a tacit admission that the system itself is a hopeless, unworkable fraud (which it is), and further, would in large part eliminate the reason for the FED's existence, which is to make a hopeless, unworkable, fraudulent system function in the real world. Bureaucracies typically don't like to admit their failings or undermine their own authority. So don't hold your breath. No, the truth is, the FED absolutely needs the inflation in order to "solve" the crisis. Which means that this crisis will be resolved through yet another crisis, the destruction of the US dollar as a currency, or at least put us all through one heck of an inflation. Hang on folks! It's gonna be a wild ride! You ain't seen nuthin' yet! serves you right piggies. good luck! there is no inflation. stop worrying about the evil government diluting all your beautiful money.